I've been using CodeLite for a while now, and so far it seems to be excellent. However, there is one crucial feature (for me) missing, or at least i cant find it. Is there a way to split view the editor? So we can have multiple different files open in 2 views? Say, header and implementation file at the same time, for example? In Code::Blocks for example, you can simply drag a tab/file to some edge of the IDE and it will automatically create a seperate editor frame. This was the case in CodeLite a year ago, however, since then we switched to different tab system which does not support this. forgive me for repeating the comparison with CB, but as far as i know CB is also based on wxWidgets, ans CB itself has been working relatively bugfree as long as ive used it? i suppose they use wxAuiNotebook ? The tabs are just confusing. Especially when you have 20 files open. Drop them and use a vertical panel that can show all open files. Something like Tab tab in the workspace view. Add highlight to the current file, and maybe also add a tree view. Then use that instead. @milasudril your commenting on a close issue. The current file in Tab is already highlighted and you can move the panel where you like. Also Explorer already gives you a treeview. (1) and (2) => Remove the tabs, so this issue can be solved. Hmm I see. As eranif said, it's not that it can't be solved. its a question of man power. Pull request are welcome. With something like this I think a series of small changes and preparations would the way to go instead of attempting to do it all at once. Another point to add to what's already been said: not everyone will agree that a vertical panel is better. I much prefer tabs. So any pull request or patch should be adding the option of using a vertical panel, not making it compulsory. I personally prefer a split view with tabs as well. It's very convenient to look at the header file, see the variables etc. while you're working on a cpp file. Plus you can look at other headers if you're going to use functions from there or if you have an input text file that you will parse, it's useful. Since we already have tabs and since C::B source code is open source, I figure it shouldn't be extremely difficult to simply incorporate existing code. I'm not familiar with the code base and don't have much time unfortunately. I know it's easy to ask and hard to do, so I will just say that the person who does this will be my hero 👶 Enjoying code lite for now, might go back to C::B in the future just because of this back and forth switch. 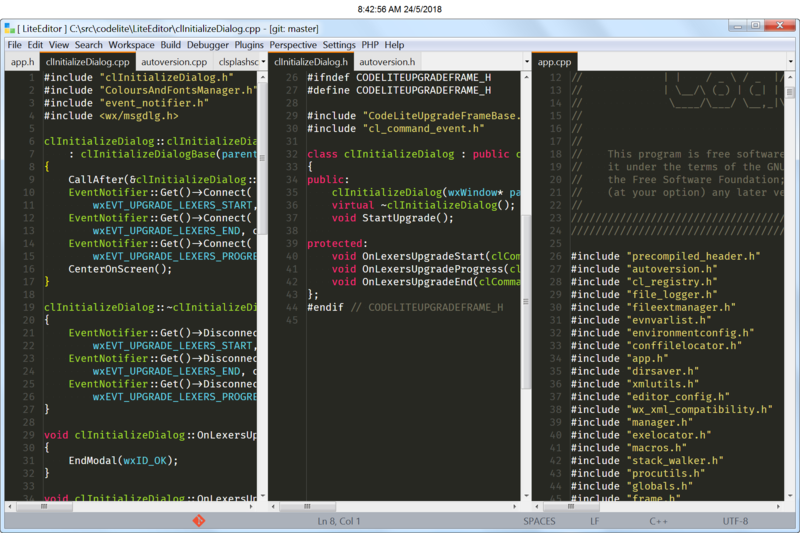 Thank you for providing this awesome IDE devs. Maybe this wasn't available when this question was first raised? I know, I know, submit a patch. Thanks. This is now implemented in git master, hope that this is what you meant: [image: splitter-view] <https://user-images.githubusercontent.com/3677711/40466473-9957cb1c-5f2e-11e8-8ded-a283273412e9.png> — You are receiving this because you are subscribed to this thread. Reply to this email directly, view it on GitHub <#1179 (comment)>, or mute the thread <https://github.com/notifications/unsubscribe-auth/AHIgjE6wIMXLaiplpl025wGtGgOc_pyKks5t1kirgaJpZM4HoSgF> . @eranif the hero! Thanks mate I will definitely check this out. I installed git master, but I cannot find this option. Can you please explain how I can enable this feature?